Card of the Day ~The Person You’re Asking About Is Trustworthy~ You drew this card as reassurance that you can rely on the person involved with this situation (and that includes trusting yourself, too). Everyone makes mistakes or acts selfishly occasionally, yet by and large, the individual you’re thinking of is dependable. He or she cares about you and will act accordingly in loving ways. 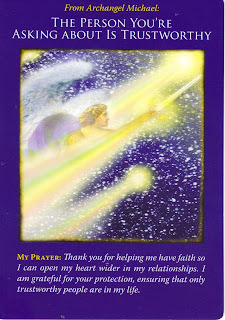 Archangel Michael asks you not to expect this person to be perfect, as this puts too much pressure on the relationship. Instead, view and treat your comrade, as you’d want to be treated: with love and compassion. I pray you have a good day my friends. I love you all!